Pennsylvania was founded on the principal of religious freedom and is home to more first churches than any other state, including the oldest German Reformed Church in America, the first Church of the Brethren, the oldest Mennonite Church and the first Methodist Church. Philadelphia played a dominant role in the establishment of Catholicism in America, with the first public mass in the New World held in 1733 at Old St. Joseph’s. Philadelphia was also a major center for free African Americans and home to the first American Methodist Episcopal church, among other denominations. Explore this sampling of sacred spaces where visitors can experience history, architecture, serenity and peace. Founded in 1732 by German settlers, Ephrata Cloister is recognized as one of America's earliest religious communities. The establishment houses a collection of European style buildings where nearly 300 members worked and worshiped throughout the first few decades of its founding. Today, the community’s rich history has created a National Historic Landmark that proudly offers daily tours, special programs and on-going research opportunities to the public. Built between 1824 and 1831, the Old Economy Village pays tribute to a 19th century religious communal group known as the Harmony Society. Originally organized in Germany by George Rapp, the society found its residence in Beaver County, and built the village to include 14 harmonist buildings and structures, a post office, warehouse, graveyard, and a large garden complete with a statue and stone grotto for meditation. Today, the village is home to several site attractions and exhibits open to the public from April through December. Established on 43 acres of green space in Bucks County, Pa., Pennsbury Manor is the reconstructed home of religious freedom proponent and Pennsylvania founder William Penn. Opened to the public in 1939, the property houses an outstanding collection of late 17th century artifacts and hosts demonstrations and hands-on activities, allowing all visitors to have a lively and interactive experience. The Manor hosts events throughout the year and continually updates their exhibits to excite audiences year after year. Located in the heart of Philadelphia, the Mother Bethel African Methodist Episcopal Church proudly serves as the mother church of the nation’s first black denomination and rests upon the oldest parcel of land continuously owned by African-Americans. The church originated in 1787 when Absalom Jones and Rev. Richard Allen, who later became the founding pastor and first bishop, encouraged black worshippers to form their own congregations after being forced to sit in the balconies during services at some of the city’s traditional white churches. Today, the National Historic Landmark houses a museum with original artifacts and exhibits from the church’s beginnings. For a true taste of America’s religious history, look no further than Christ Church. Founded in 1695, it was the first parish of the Church of England in Pennsylvania and later became famous for the Revolutionary-era leaders who worshiped there. Historians of numerous backgrounds have conducted in-depth research on the establishment, recognizing the important components of American life and history reflected in its background. The church’s burial ground has also earned the distinction of one of America’s most interesting Colonial and Revolution-era graveyards, as it is the final resting place of many leaders including Benjamin Franklin and four other signers of the Declaration of Independence. One of the more modern representations of Pennsylvania’s sacred spaces, the Himalayan Institute was founded in 1971 by Swami Rama of the Himalayas and quickly became a leader in the field of yoga, meditation, spirituality and holistic health. With various programs and activities offered in each field, this non-profit, international organization hopes to provide the knowledge, training and environment that will foster qualitative transformations and help its visitors realize their full potential. Though the first Ashkenazic congregation in the Western Hemisphere dates its founding back to 1795, Rodeph Shalom did not construct its first dedicated sanctuary until 1871 on its current site at Broad and Mount Vernon streets in Philadelphia. The building was designed by Frank Furness, considered the most exciting Philadelphia architect of his time, and inspired by the great Synagogue of Florence, Italy. To this day, the temple is one of the few in the United States that retains its distinctive Moorish-Byzantine style. Recognized as one of Frank Lloyd Wright’s seventeen most important projects, the unique design and landscape setting of the Beth Sholom Synagogue is a must-see. Since its dedication in 1959, the Beth Sholom Synagogue Preservation Foundation has worked to preserve the structure to the highest standards possible and share the stories of the synagogue with a wide variety of audiences through tours and educational exhibits. Built in response to the social and religious needs of a growing population of followers of Hinduism and other Indic religions, the Hindu Jaim Temple of Pittsburgh operates as a center of worship providing religious, cultural and social education to its members and future generations. After years of dedication and generosity from the temple’s initial members, the building’s construction was completed in 1990. Set in a park-like atmosphere in the Endless Mountains of northeastern Pennsylvania, a monument stands commemorating the baptism of Joseph Smith and Oliver Cowdry in the Susquehanna River by John the Baptist. Joseph Smith, who became the founder of The Church of Jesus Christ of Latter-day Saints, translated the Book of Mormon at a homestead in Susquehanna County. Those interested can visit the site off of Route 171 between Oakland and Hallstead. Olmsted Manor Retreat is a place of natural beauty and historical significance. Surrounded by the forests of northwestern Pennsylvania, the manor is owned by the United Methodist Church and strives to provide Christian hospitality through private and group retreats. In addition to the variety of retreats that Olmsted sponsors throughout the year, some people come for a private, personal retreat, spending time away in quiet reflection. The Sacred Heart of Jesus is celebrating its 50th anniversary of the basilica, a designation reserved for historically significant or distinctive churches in 2015. Originally built as the Conewago Chapel in 1741, the chapel was enlarged in 1768 and served as the headquarters for the Jesuit missionaries. The basilica is a symbolic sign and is used to protect the pope from the sun if he happens to visit. 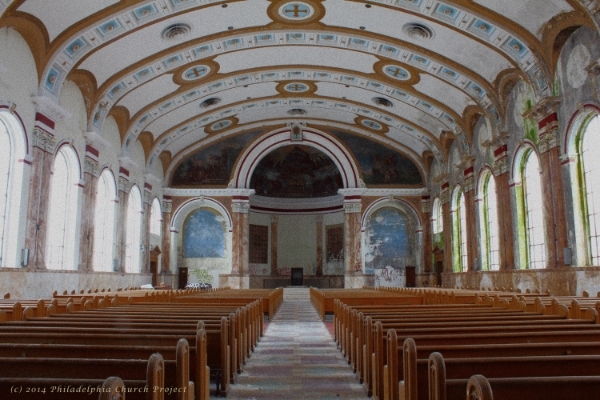 Murals can be found inside the basilica dating from the mid-1800s. Stained glass windows and the coat of arms on the walls from various bishops and dioceses can also be found inside. In 1873, Bishop Tobias Mullen, the third bishop of the Catholic diocese of Erie, started the initiative that constructed Saint Peter’s Cathedral. Architect Patrick Keely designed the structure and was responsible for 21 American Cathedrals and more than 600 churches in the eastern United States throughout his career. Complete with red sandstone, stained glass windows and towers looming 265 feet tall, the cathedral remains a dominant structure in the Erie skyline and a focal point of Catholic life in the community. Owned by the Antiochian Orthodox Christian Archdiocese of North America, Antiochian is a peaceful, 300-acre property that includes the gravesite of Saint Raphael of Brooklyn, who in 1904 became the first Orthodox bishop to be consecrated on North American soil, and who tirelessly served the scattered flock of Arabic-speaking Christians throughout America until his death in 1915. Three churches on site — Sts. Peter and Paul Chapel, St. Ignatius Church and the outdoor St. Thekla Chapel — contribute to the deeply spiritual atmosphere of the Antiochian Village. Built on a burial ground originally deeded by William Penn in 1701, this 19th century Quaker meetinghouse is active to this day and home to the Monthly Meeting of Friends of Philadelphia and Philadelphia Yearly Meeting of the Religious Society of Friends. The site welcomes visitors to step inside and explore dioramas, displays of Quaker artifacts and rotating special exhibits celebrating the contributions of the Society of Friends. A religious and architectural landmark in the Laurel Highlands, Saint Vincent is the first Catholic parish west of the Allegheny Mountains. Father Andrew Arnold Lambing, foremost historian on Catholicism in the Pittsburgh area of that day, said "It is the cradle of Catholicity in Western Pennsylvania." The basilica is a stunning landmark of Saint Vincent College and was founded by a Bavarian monk from Germany, Boniface Wimmer in 1846. It is the first Benedictine monastery in the United States. The college and basilica are operated by the Benedictine monks of Saint Vincent Archabbey. In 1734, a group of Scots-Irish settlers from Lancaster County formed a congregation just outside of Carlisle, Pa. Years later they moved to town and erected the town’s first public building in 1757. In 1774, the church served as a meetinghouse for men to call for united action by the colonies against England and was even attended by President Washington himself. In addition to its rich history, the church continues to be an important part of the life of the community. After quickly outgrowing their first church in 1867, the parish of St. Mark’s Church selected architect Richard Upjohn, Sr., to design a new building of worship for the community. Due to the generous wealth of its citizens, the church made many noteworthy improvements and renovations throughout the early 20th century including new altars, choir stalls, stone steps, stain-glassed windows and a bishop’s chair. While these renovations were being made, St. Mark’s parish worshiped with the parish of St. John, which ultimately led to the joining of the two churches in 1980. Today, the church happily accepts visitors and offers tours throughout the year. Evidence of Catholicism in central Pennsylvania dates back to the pre-Revolutionary era, when German Jesuits began establishing churches in Lancaster, Pa. In 1806, a small Catholic mission was formed in the chief town of Dauphin County and property was purchased for the construction of a new chapel. Nearly a century later, Bishop John W. Shanahan proposed the idea of the Cathedral, and the project was completed in 1907. After many renovations and additions, the Cathedral’s beautiful artwork, stain glassed windows and marble accents make it one of the most breathtaking spaces near the Capitol building. Nestled in the beautiful Pocono Mountains, the Villa of Our Lady Retreat House has staff dedicated to providing a quiet, contemplative and prayer-filled place for all to “touch God” and renew their spiritual life. Visitors can escape the business of daily life to deepen their religious experience through a journey of discovering themselves. Serving as a respected symbol of the New Church, the Bryn Athyn Cathedral is a prime example of the Gothic and early Romanesque styles that dominated architectural design when the building was erected in the early 20th century. The Cathedral sits atop a hill overlooking the Pennypack Creek Valley and has been the central place of worship for the Bryn Athyn Church since its dedication in 1919. The church and its members welcome all guests to visit the Cathedral for tours, worship services and special events. The Peace Chapel is an environmental landscape site designed by architect Maya Lin. It occupies a 14-acre site within the 170-acre Baker-Henry Nature Preserve. Located near the Juniata College campus, the Peace Chapel provides a contemplative setting within the rolling hills of central Pennsylvania where guests can escape to a serene place. Designed and constructed in 1988-1989, the Peace Chapel consists of two sites. The larger site is defined by a 40-foot circle of rough granite stones that line a shallow well at the top of a hill. A series of smoothly polished granite steps lead from the footpath up to the circle of stones. 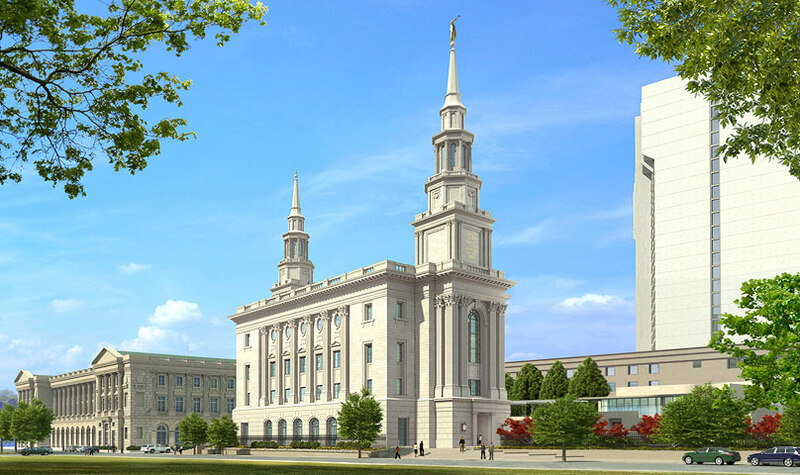 This Mormon temple is currently being expanded along Vine Street in Philadelphia. Plans for the site include a meetinghouse with a chapel, family history center, cultural center and outdoor courtyard, as well as a 32-story apartment building located next to the temple. Visitors are welcomed at a temporary visitors' facility located across from the construction zone where the missionary couple is available to answer questions. The site is due to be completed in 2016. This site is an 11 circuit labyrinth designed to mirror the labyrinth found on the floor of Chartres Cathedral in France. Today, they are used for reflection, meditation, personal growth and wellness. Villa Marie Educational and Spiritual Center is a sacred setting. They seek to inspire lifelong learning and growth. With the Sisters of Humility of Mary on the same campus dedicated to works of peacemaking, justice and care for Earth through education, health care, social service and pastoral ministry. Most Blessed Sacrament Parish was established in 1741 is now known as the Most Blessed Sacrament Church, and it is the oldest existing Catholic place of worship in Pennsylvania and the fourth oldest Catholic structure in the thirteen original colonies. When construction of St. John Gualbert Church began in 1895, a construction publication noted "Constructively and artistically, this design offers a great deal of interest. As far as we can recollect at this moment, it is the only building of its kind in existence." The most unique feature of the church's construction is its steel superstructure: almost 170,000 pounds of steel were used to construct the foundation. Other interesting notes of history: the church's 3,200-pound bell survived a fall from its belfry during the 1889 Johnstown Flood, and was recast in 1890. The church's 1897 pipe organ was donated by Andrew Carnegie through the influence of Charles Schwab. On November 11, 1957, the Diocese of Altoona was renamed as the Diocese of Altoona-Johnstown, which made St. John Gualbert the co-cathedral of the newly designated diocese.